As expected, Big Ben and his men decided to keep rates on hold at 0-0.25% for the umpteenth time. In fact, if you look closely at the recent FOMC monetary policy statement and compare it with their previous one, you’d notice that they simply repeated most of their lines. For instance, Fed policymakers maintained that household spending and business investment in equipment and software continued to expand. They also noted that both the construction and housing sectors remained weak and that they will continue to monitor economic and financial developments in the U.S.
With that, they reaffirmed their vow to use their monetary policy tools as necessary. What distinguishes their most recent statement from the one in April is that the central bank officials acknowledged that overall recovery has been slower than expected. Because of that, they decided to slash their growth forecasts for the year from a range of 3.1%-3.3% to 2.7%-2.9%. One of the factors that prompted the Fed policymakers to revise their economic outlook was the downturn in employment. Fed head Bernanke mentioned that labor conditions could still worsen during the second half of the year even though part of the jobs market slump can be blamed on temporary factors, such as higher food and energy prices and supply chain disruptions from Japan. On a more upbeat note, Bernanke noted that inflation has been picking up. However, he also pointed out that this wouldn’t be a big deal since commodity prices are already retreating. As I discussed in one of my old articles about the Fed’s inflationary view, it looks like Big Ben was right on the money when he predicted that the commodity price rallies were just temporary. The Fed is maintaining its wait-and-see approach, but it’s also on heightened alert. Just as it should be, if you ask me! After all, the U.S.‘s “recovery” hasn’t exactly been meeting expectations. Just like the Green Lantern, it’s been nothing but a big disappointment. According to Bernanke, the Fed will keep interest rates low for at least another two to three meetings. But given the current trend of growth, in my opinion, it’s likely that we won’t see any form of tightening for another six to seven meetings. Heck, the Fed even went on to say that it’s willing to push for more stimulus if that’s what it’ll take to get the economy going. At this point in time, the Fed seems clueless as to what it’ll do going forward, so it’ll probably keep a close eye on and take its cue from upcoming economic releases. That being the case, it’ll be wise for you and me to do the same. The dollar may have gained from yesterday’s bout of risk aversion, but the market’s reaction towards it could be more bearish down the line. 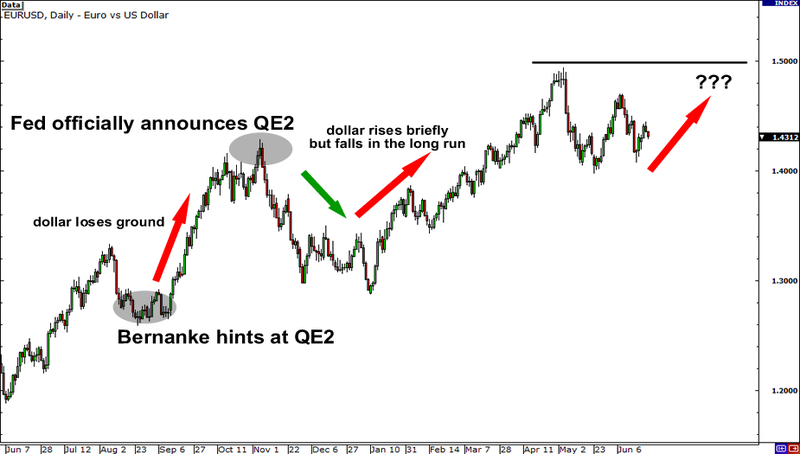 After all, the mere suggestion of QE2 was enough to cause a massive dollar selloff back in October 2010. I don’t see why the market should act any differently now that the Fed has said its door is open to more stimulus.